The American Wild Horse Campaign has a mission of preserving and protecting the wild horses of America for generations to come. For over a decade, this organization has been creating and implementing humane solutions to keep these majestic creatures wild and safe on our country’s wild lands. 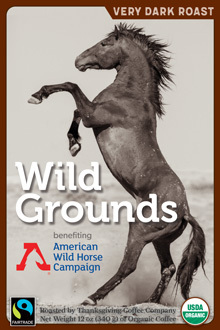 Thanksgiving Coffee has partnered with the AWHC to create Wild Grounds Coffee. For every purchase, 10% of the proceeds are donated directly to rescue wild horses. 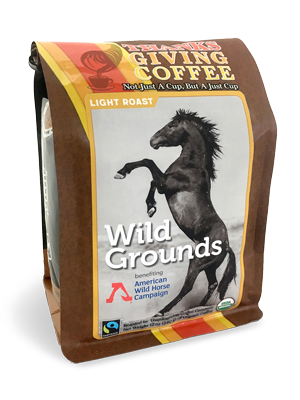 Join the movement by signing up for a monthly subscription of Light Roast Wild Grounds Coffee! 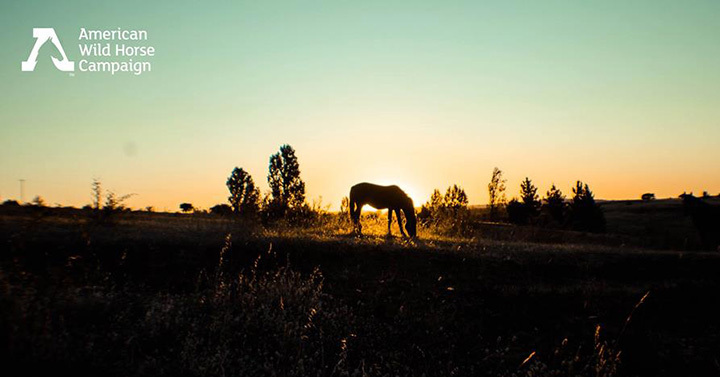 The Upsetter is our Light Roast cause coffee for the American Wild Horse Campaign. It was created by Roastmaster Jacob Long, for the espresso cafes serving Thanksgiving Coffee. What we wanted was a coffee blend with a soft acidity, and the sweetness of plums and blueberry fruit. So, we went to one of our favorite Nicaraguan cooperatives, SOPPEXCCA for the base. It is a sweet coffee, very forward on the palate, and its acidity is not bright or citric like most great coffees, making it, perhaps, out of balance, but perfect for creating The Upsetter. We married it to a fruity dry process Ethiopian coffee from the Yirgacheffe region to give us the mellow berry notes and between those two coffees you have the secret to 75% of the blend. From Mayumi Knox of San Marino, California on 6/27/2017 . We got the coffe mainly for the cause, but the aroma and the taste of the coffee exceeded our expectations. The light roast is very well done with enticing smell and a hint of chocolate - pleasantly light but not at all underroasted. We have had some disappointment lately with the lightly roasted coffee beans lacking aroma ordered from other specialty coffee roasting companies. Your coffee truly shines among the sea of so many coffe beans on the market. We look forward to ordering it again very . . .